Black metal pioneers Venom have had quite a confusing shift in members over the years. The classic/best-selling/most influential version of the band consists of Conrad “Cronos” Lant (vocals/bass), Jeff “Mantas” Dunn (guitar) and Anthony “Abaddon” Bray (drums). Their run in Venom takes place from 1980-1986 and 1995-1999. All three members have come and gone over the years. At various times, one or two of the “classic” members would exit, leaving the remaining member(s) to carry on. After Mantas walked away in the late ’80s, Cronos & Abaddon tried Venom out as a four-piece before Cronos himself left the band (to start a solo career). Keeping the band a four-piece, Mantas rejoined along with new guitarist Al Barnes (What, no nickname?) and new vocalist/bassist Tony “Demolition Man” Dolan, formerly of Atomkraft. This signaled a slight change in sound for the band as they went for a more traditional, competent & better produced thrash/speed metal sound as opposed to the raw, sloppy Satanic metal that had helped create entire metal sub-genres in the early ’80s. Eventually, in 1993, the Dolan-era came to an end and the band laid dormant. In 1995, the classic Venom line-up of Cronos/Mantas/Abaddon was back. More changes occurred. Abaddon left in 2000 and the drummer’s seat was filled by Cronos’ brother Anthony “Antton” Lant. Even more changes were in store. Mantas left in 2005, Antton left in 2009. According to Mantas, none of the classic members are ever going to work together again, but we’ll see. Enter Tony “Demolition Man” Dolan once more. In 2010, Mantas & Antton teamed up with Dolan to give us a new group called Prime Evil. No, wait… That’s what they were called. They ended up changing their name once they became aware that another band was already using that name. Now they are known as M-pire of Evil. Though this trio has never played on a Venom album together, Dolan & Mantas have worked in Venom together and the same can be said of Mantas & Antton (they also played together a metal band called Dryll). I find it interesting that Cronos’ brother would leave Venom and then later hook-up his old guitar player and the singer who once replaced him in order to form a new group that obviously borrows a lot from Venom. It’s like we’re getting two Venom groups these days. Another former Venom member, guitarist Mike “Mykus” Hickey was going to be involved in the band but had prior commitments though the band is open to working with him whenever he has the time. BTW – Does anybody know where Abaddon went? To be honest, I’ve become interested in Venom only in the last year or two. The album I chose to start with was Prime Evil (the debut of the Dolan-era) because I had read it was not as over-the-top with all the Satanic imagery and lyrics as previous Venom releases had mostly been. I ended up liking the album a lot and I would have bought the other three Dolan releases (Tear Your Soul Apart, Temples of Ice and The Waste Lands) if not for the fact that they are out of print and thus very expensive. So to find out that M-pire of Evil existed was very exciting to me. This band’s formation had totally slipped by me in 2010 when it was announced. This is the band’s debut: a six song E.P. with four covers and two originals. I gotta say, the cover songs are excellent. Not only did they choose four excellent bands to cover (Judas Priest, Motorhead, KISS, AC/DC) but they bring a level of raw power and aggression to these songs that has not been heard before (well, except maybe for “Motorhead”). I especially like their covers of “Exciter” and “God of Thunder”. When someone covers “Exciter”, the singer usually doesn’t have a gruff deep voice like Dolan does. It’s different but that’s why it works. As for the two original tracks, those are really cool too. It’s really nothing different than what you’d hear on Prime Evil. Two raw thrashy numbers. “Reptile” features some Satanic gibberish chanting that kind of takes points away from the song for me, but musically, it’s a good thrashing number. Had I not just days ago posted my list of favorites E.P.s, Creatures of the Black would’ve been on there. It seems like a full studio album could be coming very soon in early 2012 and I’m definitely looking forward to it. 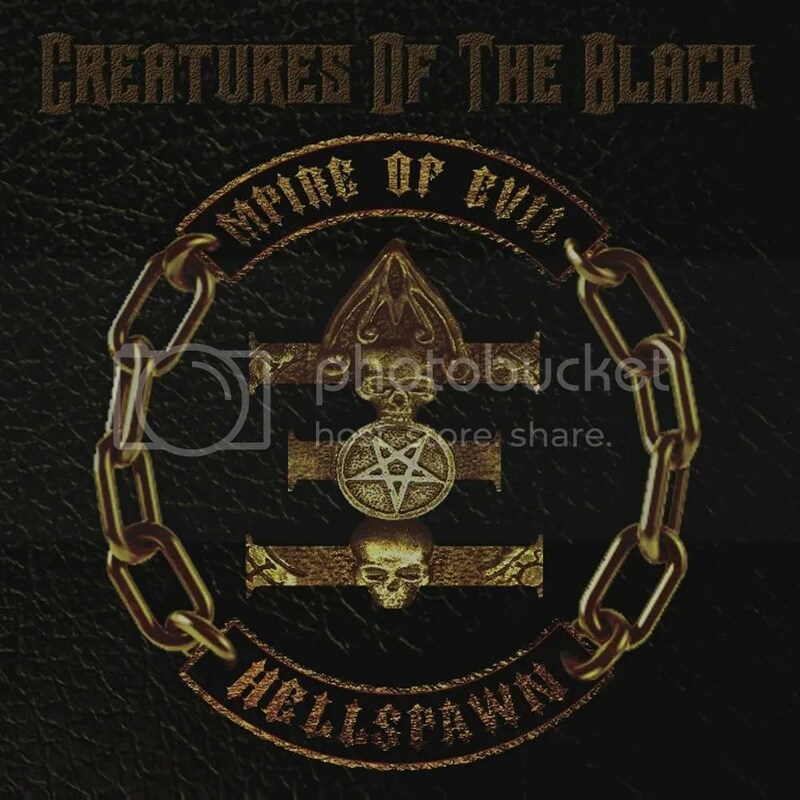 Fans of the Dolan years of Venom and fans of raw heavy metal in general should pick up Creatures of the Black.